Walmart Inc., the American retail Supergiant, over the past two years, has been piloting and implementing dozens of new technologies in stores across the US with a sole focus to save time for their customers and associates. In May 2018, They were testing self-driving technology in association with Waymo, where the customer simply would place an Online Grocery Pickup order, Personal Shoppers from Walmart would make the order ready for the pickup whereas Waymo would pick up and drop off the customer in designated time. Presently, Walmart is taking another big step by bringing a new type of supermarket featuring automated-service rather than self-service, which we believe will become the next paradigm in Retail Shopping Chains. In collaboration with startup Alert Innovation, they are all set to pilot using first-of-its-kind automation to help customers line their orders faster than before and its name is Alphabot®. Alphabot® is an Automated Storage and Retrieval System (ASRS) and Automated Each-Picking System (AEPS), armed with a capital-efficient and broadly scalable design. At the heart of Alphabot® technology is a decentralized mobile robot which has a unique ability to operate in all three dimensions within a multilevel storage structure now a norm in every warehouse, retail chains ever. These robots have a fleet of their own kind which operates within a given system under control of a single Master Control System (MCS). In an Alphabot® ASRS, the bots are in motion in addition to a highly innovative picking workstation which picks goods letting bots themselves maneuver through these workstations, and these pickers transfer items from product containers to order containers. The robots are mounted vertically, and the workstations arrayed at multiple vertical elevations, enabling unprecedented space efficiency in high-throughput systems. Overall, the system in entirety has no lifts, conveyors, or any other material-handling mechanism — hence the capital-efficiency. 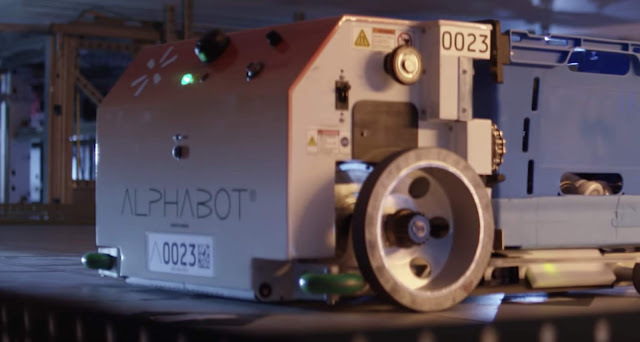 Alphabot® like conventional shuttle bot operates within a storage structure, linearly running within storage lanes on rails which also acts as beams that support stored totes (containers) of products to be picked. These robots again like shuttle robots, transfer these totes between their storage location and payload bays. Shuttle bots, however, can only travel in x/y horizontal dimensions on a planar surface such as a floor or deck. An Alphabot® robot, however, can also move vertically in the z-dimension to any elevation defined within the structure and back to moving horizontally at that elevation. Comparing to conventional shuttle-based ASRS and AEPS solutions the Alphabot® performs all of the transfer and transport functions of not only the shuttle robots but also integrating the lifts and conveyors as well as the picking workstation mechanisms as well. This enables Alphabot® to scale itself from very low-volume to very high-volume systems. Alphabots have their own vertical-drive mechanism which engages with vertical tracks to move the robot from one elevation point to another, and a wheel-retraction/extension mechanism that enables it to transition between vertical and horizontal modes seamlessly at any point and travel horizontally at any storage or workstation level. Alphabot robots' energy-storage subsystem that uses supercapacitors instead of chemical batteries. These supercapacitors charge and discharge far more quickly than regular lithium-ion batteries, have much longer useful lives (literally millions of charge cycles), and suffer no significant loss of storage capacity in low temperatures (compared to the significant loss in chemical batteries). The reduced power density of supercapacitors compared to chemical batteries doesn’t penalize Alphabot because bots recharge while they climb and descend towers, which they must do on every trip. Since not very much energy needs to be stored, relatively few supercapacitors are needed. Alphabots are thus capable of operating at 100% duty cycle during peak demand periods, and there is no expense for battery replacement, so the total cost of ownership is significantly lower than with chemical batteries. (4) picking workstation modules in which bots present totes to pickers who transfer eaches from product totes to order totes. Aisle and tower modules are assembled quickly and precisely at ground level through the use of assembly fixtures and are then raised into place, stacking one on top of another. The entire structure is thus erected very quickly and with high dimensional precision. The picking workstation completely takes advantage of the robot’s vertical prowess by having it enter the workstation from a lower deck, ascend into the transfer position right in front of the picker, and then further exit to an upper deck. This design allows for a higher rate of flow of robots and totes per workstation, as well as being ideal ergonomics for the picker. Hence the system achieves sustained pick rates of 800 or more picks per hour. Accuracy is ensured when the workstation controller uses an overhead projector to illuminate both the pick and put locations (pick-to-light and put-to-light), and sensors are able to detect the location of the picker’s hand when making a pick or a put. Since robots are instructed to move only after the picker’s hand clears a tote, the picker effectively controls the flow of robots with the motion of his/her hands, usually without even being aware of it. The brain of the Alphabot® system is the Master Control System (MCS) software. Alert Innovation has licensed from Romaric Corporation the source code for the Romaric Automation Control Engine (RACE). The company's press release further elaborated - "RACE is a field-proven software system used primarily to control automated semiconductor factories, and by licensing the source code we have been able to adapt it to create the MCS for Alphabot technology. MCS is responsible for processing all orders, scheduling all bot tasks, managing all bot moves to optimize flow and throughput while preventing collisions between bots, and interfacing to the world outside of the system." Walmart's existing online grocery service is already a huge success with customers, which allows them to quickly and conveniently order groceries online, select a pickup time and have those groceries delivered to their car in minutes. Alphabot® will operational behind the scenes making the process seem easier by automatically bringing items from storage to associates who will consolidate the items in the order. For the pickup it means less time walking the store aisles in search of products and more time ensuring customers are getting the absolute best in fresh produce, meats, etc. The Alphabot® system developed especially for Walmart is currently in process of being installed at the supercenter in Salem, New Hampshire. A 20,000-square-foot extension connected to the storehouses will have a dedicated grocery pickup point with drive-thru lanes for customers. When completed, automated mobile carts will retrieve pre-ordered items — stored warehouse-style in this new space — then delivered them to associates at one of four pick stations. Assigned personal shoppers will then pick, assemble and deliver orders to customers. The vast majority of grocery products offered in-store will be fulfilled through this system, though the personal shoppers will still handpick produce and other fresh items. Walmart plans to have Alphabot® online and running by the end of the year. With the aid of Alphabot®, Customers will have more time to focus on service and selling, the two things they often feedback are the most enjoyable part of the job, while the technology handles the more mundane, repeatable tasks. Although it is a small pilot, Walmart has large expectations from it. Its a learning curve for Walmart in adopting a new technology, and keeps them excited about the possibilities of how to use it to make the future of shopping — and working — even better.